George Nimeh is the CEO of NIMEH & Partners, the agency for changing times. Founded in 2016, his startup combines strategy, innovation, content marketing, research, and product development for businesses seeking to succeed in modern times. With funding from Google’s Digital News Initiative, NIMEH & Partners is also working on NewsGenie, a millennial media project. George is also currently earning an eMBA at the Berlin School of Creative Leadership thanks in part to winning the first INMA Scholarship offered at the school. Earlier in his career, George served as Chief Digital Officer at KURIER where he won the WAN-IFRA World Digital Media Award for “Best Digital Advertising Campaign 2015”. He was the first Digital Director and Editor-in-Chief at Red Bull. He has held leadership positions at CBS-backed iwon.com, iris Worldwide and NYTimes.com. A TEDx veteran, his 2015 TEDx Vienna talk “What if there was no advertising” has been very well received. He is happily married, the proud father of two smart and lovely girls, skis deep powder, races his Ducati far too slow, and tweets a lot. 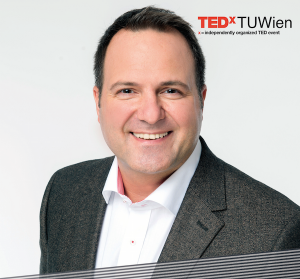 At this year’s TEDxTUWien 2018, George will discuss a 10 random details and experiences from his professional and personal life which may not be so random after all. Do seemingly small things add up to significance? Let’s find out together.